We have a 4.8 shoe rating on RaceRaves.com. Runners rate us high for difficulty, scenery, production and SWAG!!! Read more reviews on RaceRaves.com. This run; which turned into a walk, was the most challenging event I ever put my shoes against. The beginning wasn’t so scary as I thought it would be, but neither was my husbands bone marrow transplant. As the journey progressed the wind picked up as every inch of my body struggled to move forward. The days were long in the hospital after transplant and every step of this journey parallels with my husbands walk through the last 7 months. My lungs were raw and in pain and I remember just a few weeks ago when Philips lungs were blocked. Halfway through the journey I was completely done. My legs didn’t want to work, I had to force the motion to move forward. My stomach was in pain and nausea piled with defeat had me wanting to give up. I didn’t prepare for this event and definitely not carrying the appropriate weight. How could I just give up on my husbands walk.. He wasn’t prepared either? I pushed up those hills, my breathing was weak, prayed to God several times for mercy. How he must have felt during those times of struggles consumes my inner soul as I ignored my flesh. I rounded the corner for the last hill up to the bridge when ocean waves of emotion struck my throat. I am almost done, my husband is almost done, we got this journey and we are pushing through the wind of defeat and claiming victory together! This is a great race with something for everyone. And it’s for a great cause! They have distances from one mile fun run to 50k ultra. I ran the 10k in 2015 and 2016, this year I ran the half marathon which tours Baylor, along the river, and through the zoo (my favorite). First half is flat, the second half not so much. The goodies were awesome, it’s definitely worth it to run the 5k the day before for the Phoenix challenge. There are other fun challenges for a little extra bling as well. And the fajitas after the race were delicious! I will definitely be back next year, either for the marathon, or maybe the ultra. Hilly Half – so worth it! First half or so was flat, but after the run through the zoo, things go hilly and very tough BUT what a beautiful course! I plan to run again next year and will be more prepared, and I may be brave enough to try the optional climb up Jacob’s Ladder. The run through the zoo was unique and such a great experience. When do you run 13.1 miles and get to see a tiger, lion. giraffe, sloth and much more?! Loved that the race started right outside the hotel when packet pick up was. We were able to stay in the lobby until the start. Post race food and beverages(some adult! ), was amazing. Have been promoting the race to friends and I think a big group of us will be making the 1+ hour journey from Round Rock to have some fun again! 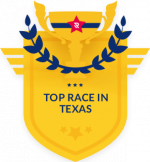 This IS the best race in Texas! Miracle Match is an absolute must do for all serious and not so serious runners. Why? Great cause. Absolutely beautiful scenery. Tough but fun course. Awesome support. Great medal. Jacob’s Ladder. Race director who is passionate about the race and the runners and knows what she’s doing and does it all with a great sense of humor! Fantastic finishers shirts/jackets. Delicious food and beer at the finish and plenty of it!!!! Need I say more?? ?